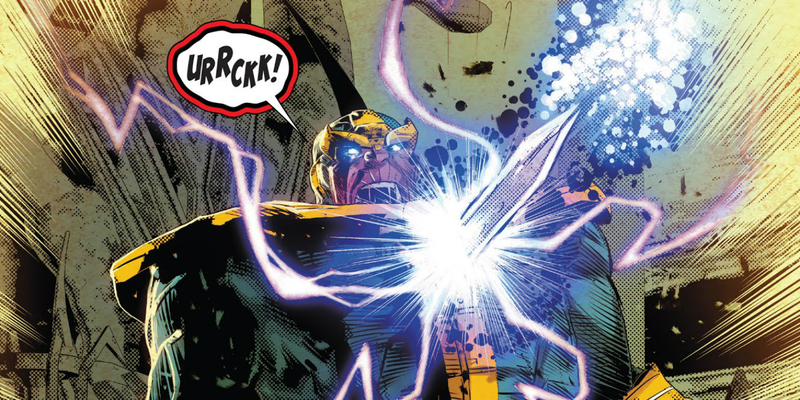 A pivotal moment in Avengers: Infinity War is reversed in the pages of Infinity Wars #1, with Gamora not just killing Thanos, but choosing to actually deliver a killing blow when Star-Lord stands in her way. The master plan executed by Thanos in Infinity War hinged on Gamora, the only being in the universe who possessed the knowledge of the Soul Stone's location. Knowing what Thanos would do for the stone, Gamora forced Star-Lord to promise that he would kill her to keep the secret safe. When the moment came, Star-Lord failed to pull the trigger, hesitating long enough to allow Thanos to capture Gamora and retrieve the Soul Stone. In the end, the inaction leading to the death of Gamora was just the first thing that made Star-Lord the worst hero in Infinity War. Now, the comics are turning the tables. In Infinity Wars #1, Gamora shares a kiss with Star-Lord after failing to convince him not to answer Doctor Strange's summons to form a new Infinity Watch. The meeting at the Sanctum Sanctorum is interrupted by a character known as "Requiem," who arrives to claim the Infinity Stones having already murdered Thanos in dramatic fashion. Requiem is revealed to be Gamora, but when Star-Lord tries to stop her, betting that Gamora won't kill him, she states that "nothing ever dies, Peter." And with that, stabs him in the chest. Star-Lord's death hasn't been confirmed just yet, but his chances of survival appear dim. Gamora may have known where their paths would take them once she stole the first Infinity Stone - making a romantic moment seem more like a kiss goodbye. Gamora's turn to the dark side is most likely linked to the fact that part of her soul is trapped in the Soul Stone. It could be that Gamora won't be the hero she once was until she's finally whole again. Gamora intends to get her soul back, and her actions in Infinity Wars #1 prove that she's willing to do whatever it takes to accomplish her goal. And for those worried, it's possible that Gamora was willing to kill Star-Lord because she knows that once she has all six Infinity Stones, she can simply resurrect him. The death of Star-Lord once again reflects how different the Marvel Universe and its characters are in comparison to their MCU counterparts. It also shows how much more ruthless Gamora is than Star-Lord. In killing her lover, Gamora earns the title of "the deadliest woman in the universe," a name she has been called since her earliest appearances in the early 1970s. The MCU's Star-Lord may have been unwilling to take the life of the woman he loved... but Marvel reminds fans that the comic book version of Gamora would kill Star-Lord without a second thought. Infinity Wars #1 is on sale from Marvel.